DAG: Soapbox - Restrict processes from tampering with files. » Dag Wieers » Home-made » Soapbox - Restrict processes from tampering with files. Soapbox - Restrict processes from tampering with files. Beware this can be used for security-purposes, but it can deliberately be circumvented. 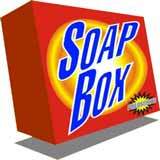 Soapbox only impacts dynamically linked programs that properly use glibc functions. I'm currently looking into a safer implementation using ptrace. Soapbox also triggered some bugs in applications that trusted system calls too much. So you can use soapbox to test your programs for these kinds of mistakes too. According to the Jargon File, a sandbox is "A controlled environment within which potentially dangerous programs are run.". It was written to sandbox my RPM build system to prevent pollution of my clean build environments by untrusted Makefiles. Intelligent people would wonder why building package as a user isn't sufficient. My aim was to try to complete the build-process as successful as possible, and present the builder with all the errors that occured. The most important fact being to automate as much as possible (creating automated mails for upstream developers, building large sets of packages automatically). Reducing the time to fix broken scripts and reducing the number of broken builds before a clean package is created. Time is precious. Soapbox is optimized with that purpose in mind. Report bugs to: Dag Wieers <dag@wieers.com>. soapbox: Attempt to open("/tmp/ccI0TsPz.s", O_RDWR|O_EXCL|O_CREAT, 0600). soapbox: Attempt to open("/tmp/ccITDyyh.o", O_RDWR|O_EXCL|O_CREAT, 0600). soapbox: Attempt to chmod("/usr/src/soapbox-0.0.7/libsoapbox.so", 0755). soapbox: Attempt to chmod("/lib", 0755). soapbox: Attempt to chmod("/usr/bin", 0755). soapbox: Attempt to open64("/lib/libsoapbox.so", O_WRONLY|O_CREAT, 100644). soapbox: Attempt to chmod("/lib/libsoapbox.so", 0600). soapbox: Attempt to chown("/lib/libsoapbox.so", -1, -1). soapbox: Attempt to chmod("/lib/libsoapbox.so", 0755). soapbox: Attempt to open64("/usr/bin/soapbox", O_WRONLY|O_CREAT, 100644). soapbox: Attempt to chmod("/usr/bin/soapbox", 0600). soapbox: Attempt to chown("/usr/bin/soapbox", -1, -1). soapbox: Attempt to chmod("/usr/bin/soapbox", 0755). I now noticed that it is trying to install in /lib, but that's not what I want. Let's put everything in /var/tmp/soapbox, please. soapbox: Attempt to mkdir("/var", 0755). PS: Sadly install is doing some useless things, eg. too many chmod()s and some mkdir()s that are unnecessary. Soapbox is overloading internal glibc functions, typically the filesystem system calls. When calling one of these overloaded functions, it will verify if the source and/or destination paths are part of the 'allowed' SOAPBOXPATH. In case it is, it will use the original system call. If it isn't allowed, it will return 0 (Successful in case of 'warn'), EACCES (Permission denied in case of 'err') or it will halt immediatly returning successful ('halt'). The current implementation has some problem corner cases though. For instance, some processes open files O_RDRW but only read from it. At the moment, this will be denied although theoretically we could allow it by overloading write and tracking some things. The BUGS file states some other cases that we could improve. There is some more documentation inside the package. There are possibly other ways to work around the overloaded functions, yet it is still useful together with the normal file-permissions. To fake succesful completion for changes that a user can't possibly make because of permissions. Another issue regarding hardlinks: hard-links inside the safe-path allows to overwrite files outside the safe-path. I've been thinking to deny writes with a hard link count of more than one to prevent this from happening. You can prevent this for now, by making sure the DESTDIR is always empty. If you find any of the cornercases that are not implemented/supported or weird behaviour in Soapbox (segfaults, processes acting weird), try to isolate the problem to something simple and send it to me. There are a lot of debug possibilities, so finding the cause is fairly easy. This faking seems to trigger bugs in other software. I've come across some problems that were caused by applications that assumed too much and checked too little. Resulting in a segfault. What I like to implement next is a redirect-option, so that changes made to files will result in a copy made to another filesystem/path. And the changes are made there. This will make sure that programs will work as they should in all conditions and it is still safe. Additionally, you could diff between the original files and your 'redirected-root'. This however is far more complex than what soapbox represents at the moment. And maybe should be considered for a seperate project. Soapbox is only useful under certain conditions (how it is implemented now), where writes are considered critical. But in some cases reads can be considered critical too. And maybe you want to allow reads from one dir and writes to another dir. So you have to be able a per directory and a per file basis configuration. Especially when you want to return EACCES for one file and succesful for another. That's where I want to go. An apache-style configfile that is defined in environment variable SOAPBOX and that will allow you to configure the default behaviour and specific file and directory behaviours.